Added heat bed to fix corners lifting - now much worse! Posted July 9, 2013 · Added heat bed to fix corners lifting - now much worse! So I was using blue tape without much problems, though I had some parts that would curl up at the corners. I've switched to a heatbed that I've tried with both kapton and blue tape. The initial adhesion is great, but now the curling is much much worse than without the heatbed -- which was what the heatbed was supposed to solve. What could be causing my problem? Should I just rip out the heatbed? It's worse with Kapton, it's level but depending on which software I use I have to manually tweak the first layer height. netfabb prints the first layer way too low and cura seems to print a bit high. I've not tried brim, I'll give it a shot. What causes it, and why would a slower fan help? And why would it be worse on the heated bed than just the blue tape? I want to understand the phenomenon so I can better figure out what things to try and why. Kapton is harder to stick to then blue tape but gives a smoother finish. It sticks much better than glass though. Another setting I forgot is, to go for a thick first layer as well. 0.3mm in Cura. What you are trying to do is get a seal around the edge. Once that seal goes and air gets underneath that part of the model cools and shrivels and goes worse then if you didn't have a HBP. The lifted edge gets bigger then. did anyone ever do a vacume mold style print bed for the ultimaker. tiny little wholes through the alu plate. sucking air out, pulling the PLA tighly down ? At what temperature do you set your heated bed? If you clean the blue painters tape with isopropyl alcohol (aka rubbing alcohol) it cleans off the wax on the non-stick side (which keeps the tape from sticking to itself). This will make your parts stick about 5X more powerful and you will have a new problem - getting parts off the blue tape. Or if the blue tape lifts at the corners then use wider blue tape. It should be at 70C. I found that at 20C to 60C the heated bed does nothing for me. But at 70C something suddenly happens and things stick real well to kapton tape. Some people even turn off the heated bed after the first layer and claim it sticks even better when it cools below 60C. 1) Brim, brim brim brim brim! Brim is great. Use it. Around 10 passes (4mm) is usually enough. 2) Rounded corners helps (but brim gets around that anyway). It's easier for the corners to lift as they have lots of force on a tiny tiny point. Rounding them helps a lot. Or use brim (did I mention brim?). 3) putting vertical holes through your part helps - from top to bottom. Also consider turning off the bottom layer if you don't need it. This shouldn't be necessary but can really help. 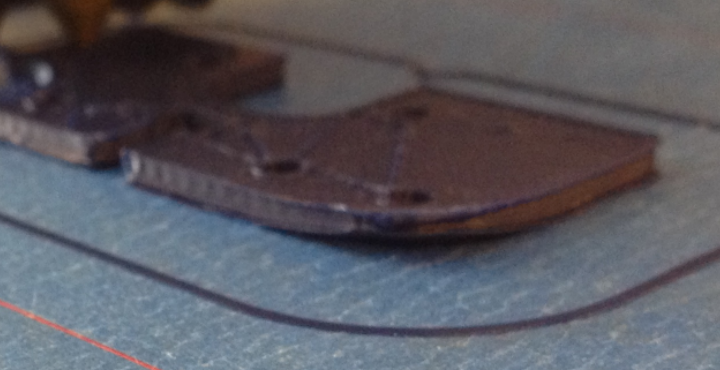 4) Print first layer thick, slow, and hot. .3mm, 10 to 20mm/sec and 240C. I no longer do .3mm first layer as I am better at levelling but the point is to shove that blue plastic hard onto the kapton or blue tape.